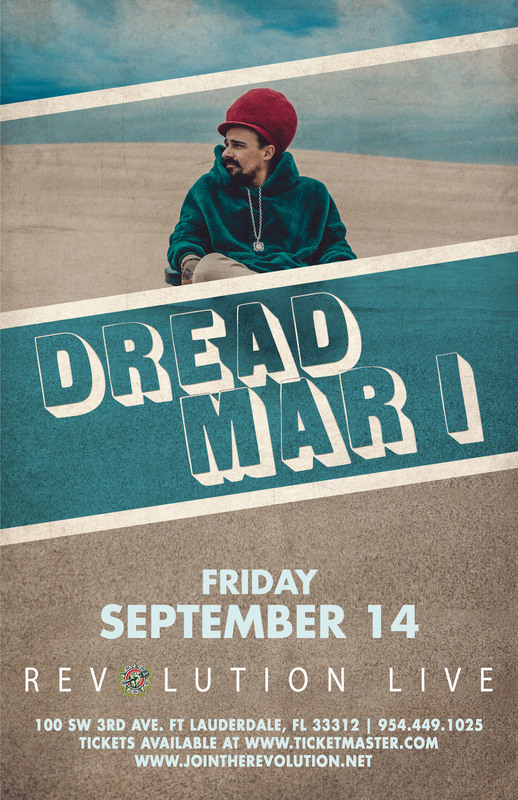 Dread Mar-I is a charting, best-selling Argentine reggae singer, songwriter, and bandleader. His sensual, passionate vocal delivery ranges over a style that combines deep roots reggae with the sweetness of lovers rock. Dread was born Mariano Javier Castro in Quequén, Argentina in January of 1978. When he was seven years old, his family moved to Maipú, a suburb of Buenos Aires. Besides going to school, he worked in his father’s bakery. His interest in music, reggae, and Rastafarianism in particular came about during these tender years, as he heard Bob Marley’s music in the neighborhood. He graduated high school and worked, honing his musical chops at night. His first professional gig was as lead singer of the Reggae Messengers. After three years, Dread put together a band and went solo. His debut album, Jah Guia, was initially issued independently, but garnered wide attention when a couple of enterprising DJs decided to play it. His gigs got larger and soon the major labels came calling. Sony/BMG signed him and reissued Jah Guia across Latin America in 2006. Sales were better than anyone expected. He was asked by renowned reggae big band Los Cafres to be a stable opener for them (and sing in their backing chorus), including a massive show at Luna Park, which greatly expanded the singer’s profile. Later that year he and his band performed at the first annual Bob Marley Day festival at Luna Park with the Wailers and Peter Tosh Band. Working with Los Cafres and headlining his own gigs had their advantages; because of the attention — and the money — he was able to record a second album with his own band, Los Guerreros del Rey. It was released in 2007. The following year, with the release of the album Amor-es, Dread became an in-demand attraction. He played 70-plus shows nationally and toured abroad as well. By the time he released Viví en Do in 2010, he was the most popular reggae singer in Argentina, and had established an international following that reached across most of Latin America. His reputation also extended into the Caribbean: 2011’s Tranquilo was a collaborative album with no less a talent than Jamaica’s Luciano. With his new backing band, Warriors of the King, he took his show to Mexico and the United States. In late 2011 and early 2012, Dread worked at Panda and TAMS studios and delivered Transparente, a record that took him onto the streaming charts in the reggae, tropical, and Latin categories. It also revealed his increasing studio savvy — he mixed it himself. Its success also made his Luna Park shows all but impossible to get into; tickets sold out months in advance. He went back to the studio and issued the hit single “Nada” (backed by a Jamaican chorus) in early 2014. He followed it with the video single “No Te Asustes Ahora,” which netted hundreds of thousands of views in its first weeks on YouTube. As a result, the 17-song full-length En el Sendero went gold. In 2016, Dread celebrated his tenth anniversary as a recording artist with a show at the massive El Planetario in Palermo, Buenos Aires. The price of admission was donations of food, clothing, or cash for the homeless. An expansive audio-video package entitled 10 Anos — featuring both new and catalog songs as well as a documentary — was released and climbed the streaming and download charts. The recording also featured the studio track “Hoja en Blanco,” a revisioned vallenato standard. A demo version of it appeared on the artist’s Facebook page and garnered over five million views.